Bangladesh’s apparel exports to India, a close competitor in the global markets, have seen sharp rise by 115% to $279 million in the last fiscal year. Exporters and trade analysts attributed quality and reasonable price of clothing products for the sharp rise in export earnings. 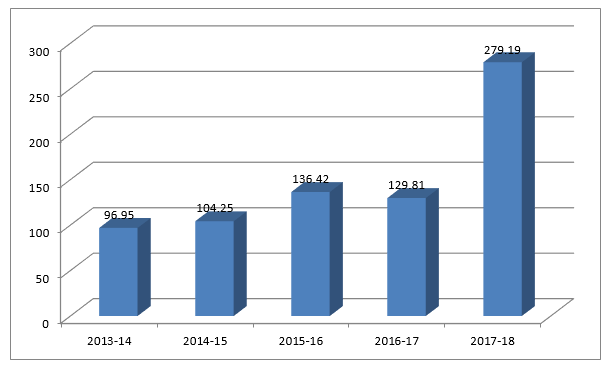 In fiscal 2017-18, Bangladesh’s RMG exports to India stood at $279.19 million, up by 115% compared to $129.81 million in the FY17, according to the Export Promotion Bureau (EPB) data. On the other hand, global brands are opening outlets in India and sourcing from Bangladesh, which may be another reason for the recent rise in export earnings from India, said Salam, a Former President of Bangladesh Garnishment Manufacturers and Exporters Association (BGMEA). However, the export earnings from the neighboring country could be more, if the non-tariff barriers are removed. “India is a very potential market for Bangladesh as it has the second largest population after China. While, there is middle class with handsome disposable income,” former caretaker government Finance Advisor AB Mirza Azizul Islam said the Textile Today.